Cure Sarcoma is a nonprofit organization that supports patients and their families who are suffering from adult soft tissue sarcomas. Soft tissue sarcomas lag behind therapeutic research and do not have established remedy. 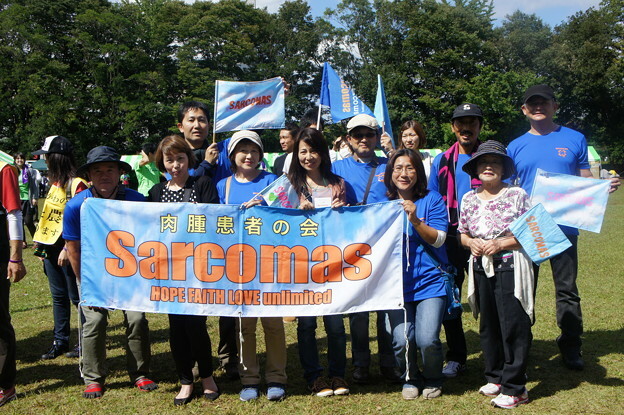 It is said that 5 to 8 thousand new patients are diagnosed as sarcomas in Japan. Among them, adult soft tissue sarcomas that develop in the thoracic and abdominal regions consist the majority other than children’s sarcoma and bone sarcoma. Adult soft tissue sarcomas have resistance to chemotherapy and radiotherapy. Therefore, they tend to relapse repeatedly after surgery and metastasize in the lungs, liver and peritoneum in the end. They have very unfavorable prognosis. As a result, patients are often puzzled, frightened, and disappointed. They also feel very isolated because there are very few similar sarcoma patients around them. No standard treatments are available other than surgical treatment. Patients and their families and also doctors who treat sarcoma patients daily are eagerly looking for new therapy to be developed sooner. Furthermore many sarcomas tend to relapse repeatedly, which requires patients to continue treatments for a long time. Very high medical expenses heavily burden the patients and their families. Their mental damage is severe as a result. There are so many obstacles for them to think about the future life. The main objective of Cure Sarcoma is to help the adult soft tissue sarcoma patients to realize rich, happy and peaceful human ways of living by removing or soothing patients’ anxiety. In order to realize this objective, it is inevitable to work on the improvement of medical treatment environment. More importantly, however, it is important that the patients who are having daily restlessness share the information and improve mutual communication with other patients. If patients actually meet face to face and talk about their problems or anxiety, they can share how they have overcome the problems, exchange information, and give and take advices with each other. We believe they can be more proactive about their own lives and can face the medical treatment positively. As a result, we hope that sarcoma patients start to enjoy their current lives much more and participate in the medical environmental change activities as much as they can. This will help patients’ overall QOL to improve. t is Cure Sarcoma’s objective to contribute to the happiness of adult soft tissue sarcoma patients and other intractable disease patients by conducting the patient assistance and sarcoma treatment promotion activities.